Do Directors View Their Nonprofit Boards Through Rose-Colored Glasses? Being asked to join a nonprofit board is, in itself, an honor. To be working alongside other honorees for a cause that addresses world, community, professional or association needs commonly evokes in directors a mix of pride, loyalty and reverence. Call it the nonprofit “mystique” if you will. 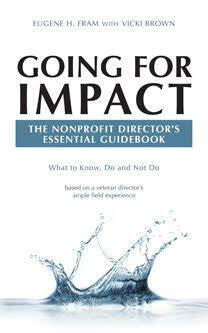 Having served as a volunteer director, board chair and consultant, I am often tempted to call it the nonprofit “mistake.” It is, in some instances, a perception that may blindside the director and stunt the growth potential of the organization. Our board is doing a great job—yes, the board is meeting goals and verifying all the compliance policies and impacts. But is this satisfaction with the status quo dissuading the board (and subsequently the organization) from setting stretch goals? Is it motivating management and staff to maximize client service? “Doing a great job” is often a mantra for an organization’s failure to reach its potential. Our worries are over—we just hired a great new Executive Director—the board needs to monitor the new CEO who may not be “great” if the board is satisfied to set low standards allowing the him/her to simply “mind the store.” Too many boards seem to be content with this modest level of incremental growth– deferring the creative and entrepreneurial efforts until the next strategic planning cycle and then letting them slip between the cracks. A robust evaluation of the new hire should be held annually and never left to the whims of the board chairs or a simple board checklist survey. When push comes to shove, our board can raise big $$–this may be true but 2015 national statistics show just the opposite. Sixty-five percent of nonprofit CEOs gave their boards academic grades of “C” or below for their fundraising efforts –in this age of rampant grade inflation! * Boards are hesitant to fully partner with the CEO in developing resources for the organization. They often abdicate the responsibility to the CEO or, on occasion, ignore him/h. Our programs are superior to other similar nonprofits—systematically prove that statement! Actually make the point-by-point comparison. This “comparison-shop” is something an alert board should do every three years. It will provide a clearer picture of the organization’s strengths and weaknesses. In the case of the nonprofit’s relative under-performance, it will generate a relevant discussion on what to do about the gap in standards. It’s entirely appropriate for a director to act as cheerleader for his nonprofit—that’s what directors are supposed to do. But first they must remove the tinted glasses and take a hard look at what’s happening on the inside— then enlist their esteemed cohort in an effort to right all possible wrongs or seize the potentials for improved client services. That accomplished, he/s will have a compelling reason to spread the word! ← Is there truth in the statement that ALL nonprofits are actually businesses, and they need to be run like businesses?